Edibility – 4/5 – Firm and flavoursome. 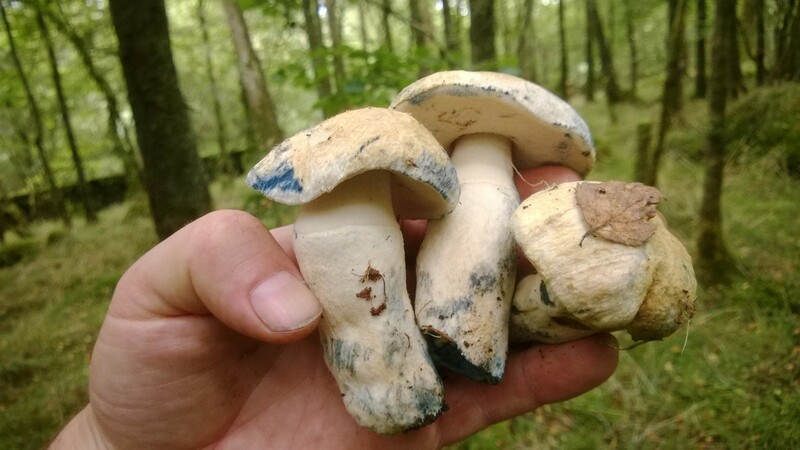 Almost as good as a cep and less likely to be maggoty. Should always be well cooked – mildly toxic raw. 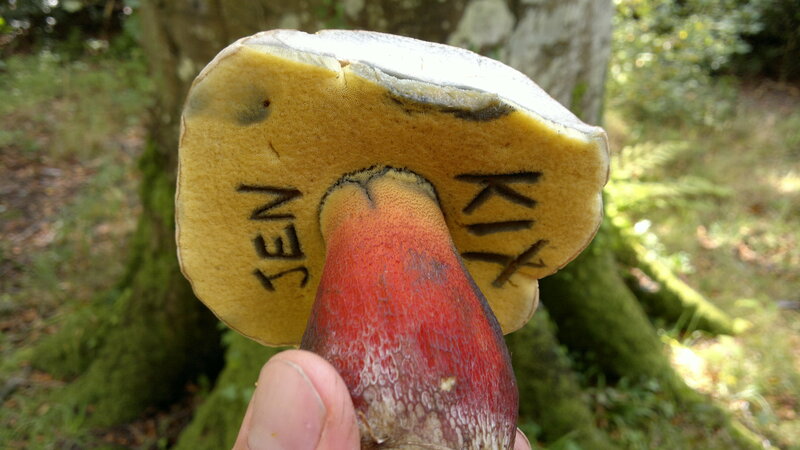 Identification – 4 /5- A solid bolete with a 4 – 12cm velvety tan to deep brown cap; fat stem, thicker at the base which is yellow with many tiny red dots making it look red; the pores are red, but the tubes above (when cut) are yellow, as is the flesh throughout. The most distinguishing feature is the flesh turning rapidly deep blue when bruised or cut. 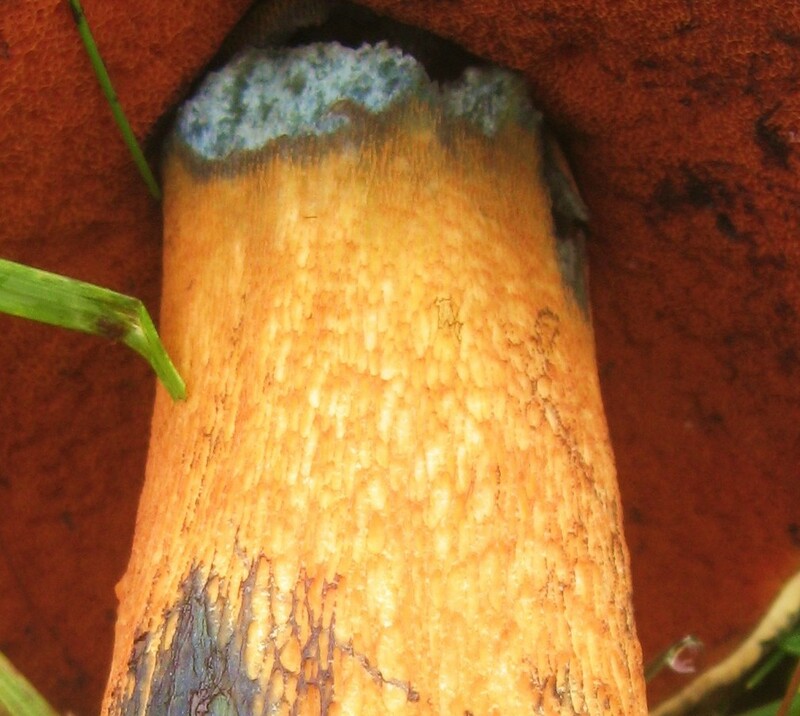 Be aware of the lurid bolete (boletus luridus) which differs in its paler cap colour and the presence of a net pattern (reticulum) on the stipe (see picture below). 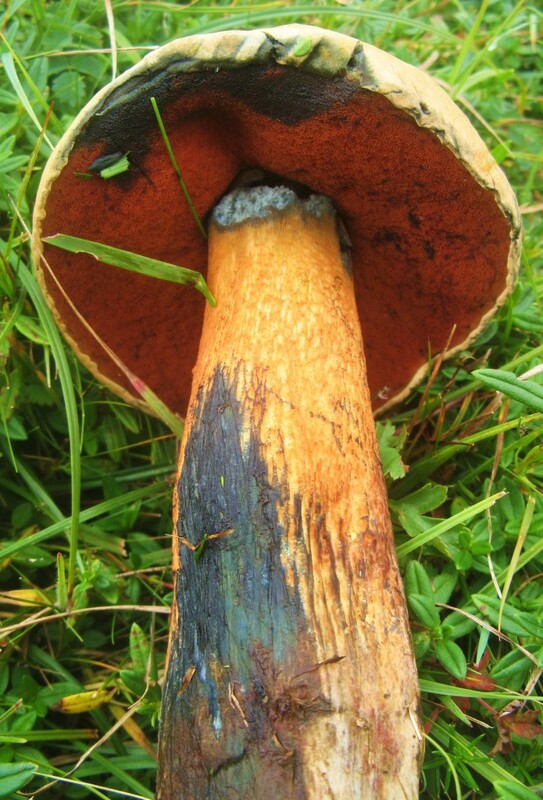 Lurid bolete is also edible, but has more reports of adverse reactions in a small proportion of people. I have also read that it may cause nausea if alcohol is consumed 48 hours either side of ingestion. Distribution – 4/5 – Common and widespread. Usually found in groups. Habitat – Can be found with deciduous and coniferous trees, though 90% of my finds come from beneath beech. Roadside verges with beech hedges, so good for many species, are great drive-by hunting grounds. Mushrooms are magic, and few more so than the scarletina bolete. 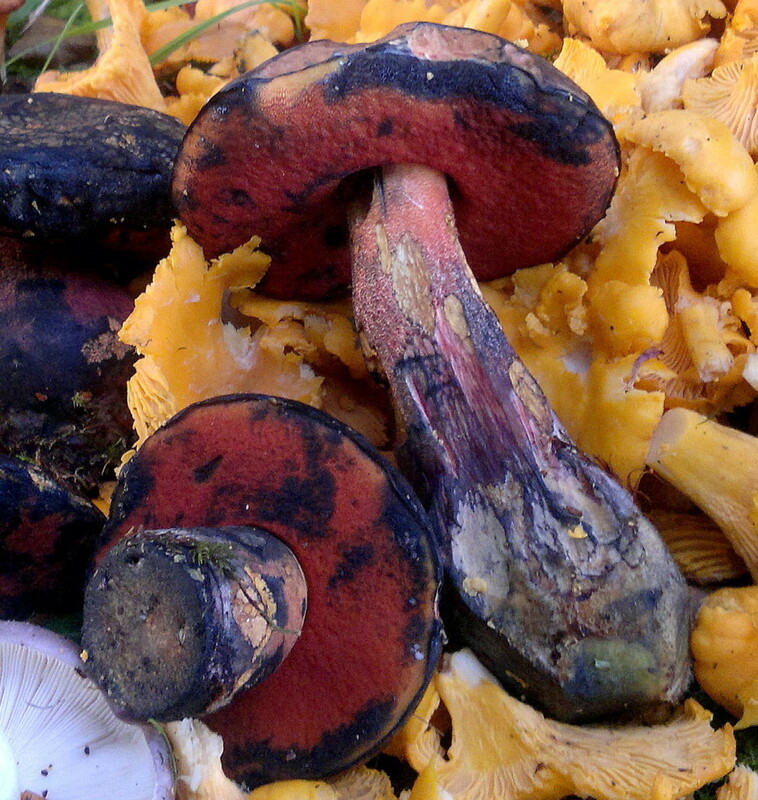 A red-pored mushroom with flesh that turns from bright yellow to deep blue within a few seconds of being cut, is not what most people expect of a gourmet mushroom. But there is no such thing as an edible or inedible looking mushroom, they just are what they are. In fact you are much more likely to poison or even kill yourself with an “edible looking” mushroom. 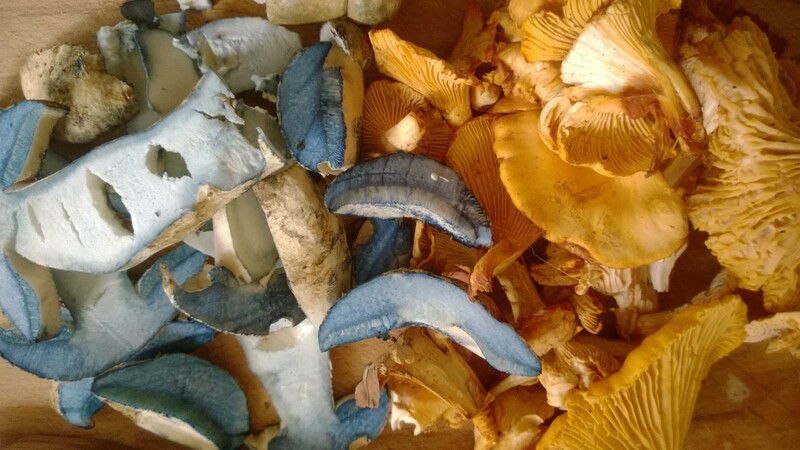 The blue discolouration (rapid oxidisation I think) fades on cooking, so if you want to shock your dinner guests, gather up some of these beauties, display them at the table, then chop and flambe them in front of their startled eyes. You will get a good insight into how much they trust you too! The texture is excellent and the rich, earthy flavour of firm young specimens vies with cep. They also dry well. I use them as the flavour engine in risottos, in game stews and mixed fricassees. Startling colour changes are not uncommon in the wonderful world of wild fungi. They should be admired without prejudice and used as a helpful clue to the identity of the mushroom. Here are a few more of my favourite colourful characters. 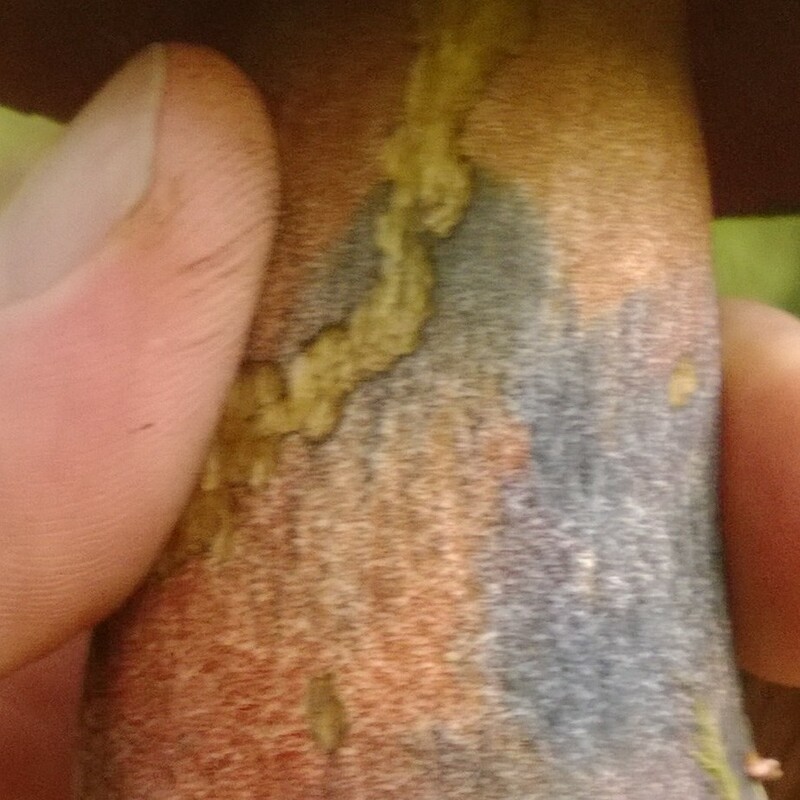 The bitter beech bolete has yellow pores and a red stipe with a pale net pattern (reticulum). Mostly under beech, occasionally oak. Despicably bitter – not edible. I try to resist “rules of thumb” for fungi identification, but red pored or stemmed boletes with a reticulum is generally a bad sign for mycophagists. Most similar to the scarletina bolete, the lurid bolete’s main distinguishing feature is its reticulum. This isn’t always very obvious – I had filed this picture as scarletina bolete, and only when I zoomed in did I notice the reticulum. 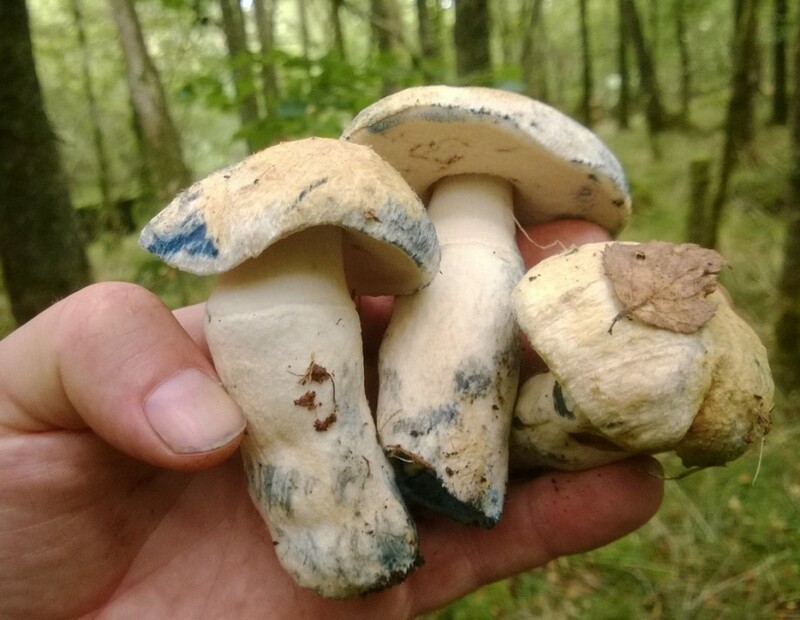 This isn’t a cataclysmic error in a culinary setting – this is an edible mushroom but has been reported to cause mild gastric upset in some people and is not recommended in conjunction with alcohol – though I know people who eat it happily with a glass of wine. So much of fungi edibility relates to personal tolerance, and the only way to know is to eat a little, well cooked, first time round. This is a beautiful and rare bolete. I have a couple of patches around Galloway where I gather few mature specimens every second year, if I am lucky enough to be visiting when they are in ‘bloom’. The pale, creamy colour of the flesh makes the rapid colour change all the more dramatic. These guys seem to go blue if I so much as look at them sometimes. They are delicious, and can keep their colour through cooking, which looks rather lovely next to golden chanterelles or saffron milk caps. 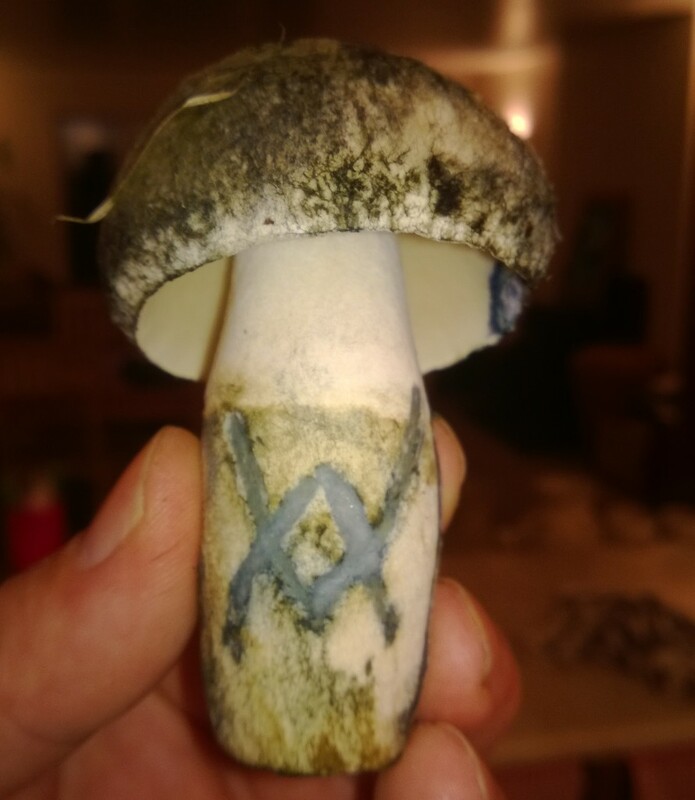 Cornflower bolete – gyroporus cyanescens – with my runic initials! In my research on fungi and plants there are several times your website shows up in the results – and you have great info. I am in Canada and enjoy checking out your site every so often. Keep up the great work! 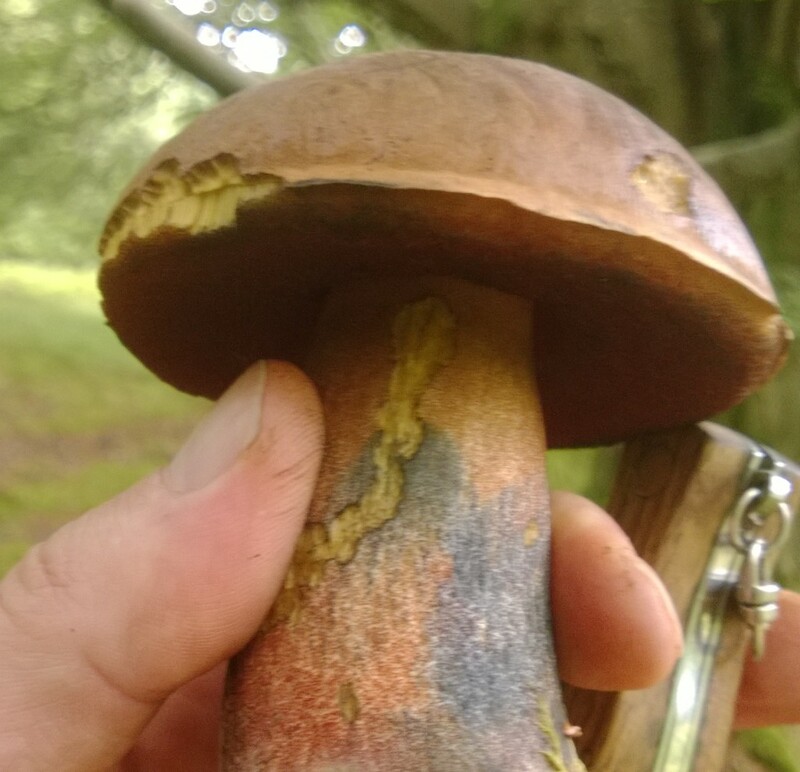 Hi Mark, Used this page at the weekend for confirmation when we found what we thought was a Scareltina Bolete. 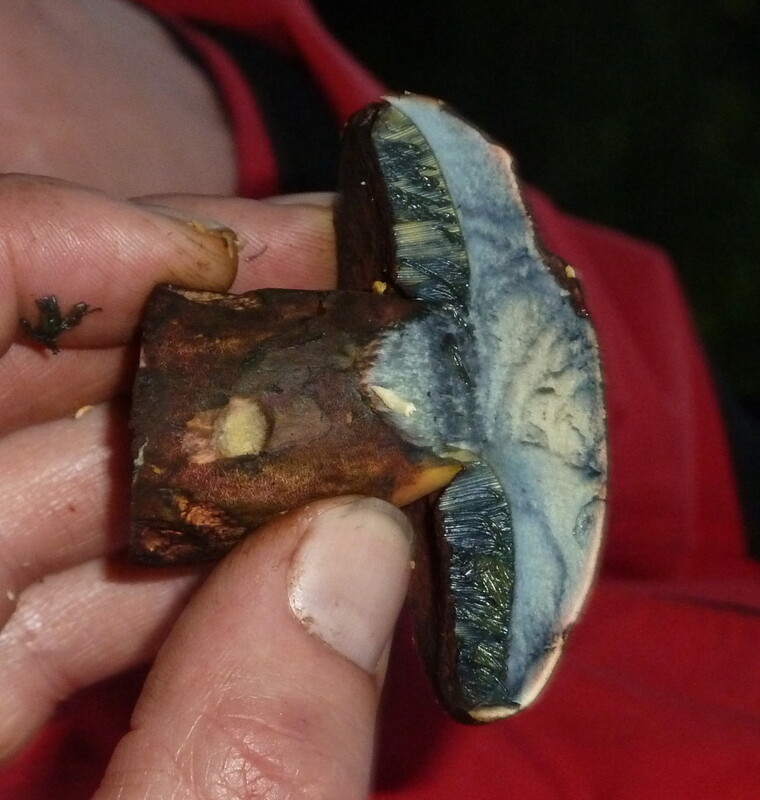 Great resource, it was fascinating to see the colour change and it was indeed a tasty mushroom. Enjoyed your site, easy to read and your description are great.